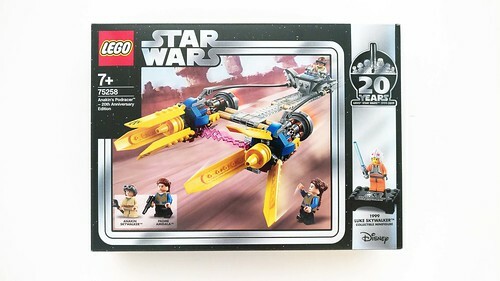 As we know by now, LEGO will be releasing five sets to celebrate the 20th anniversary of the LEGO Star Wars theme and the first one that I’ll be taking a look at is Anakin’s Podracer (75258). The set pays homage to the set (7131) of the same name from 1999. 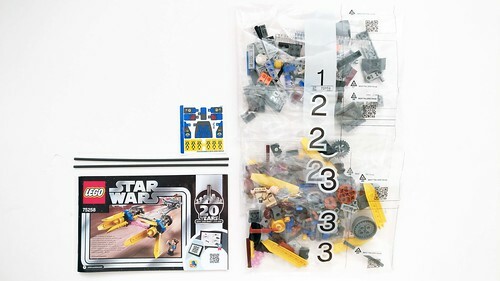 It has 279 pieces and will retail for $29.99. 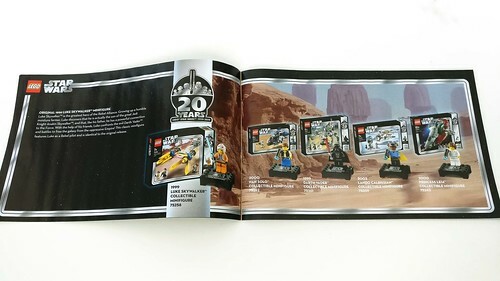 Unlike with the instructions of most other sets, the ones for the Star Wars 20th Anniversary sets will have some additional information about these sets. 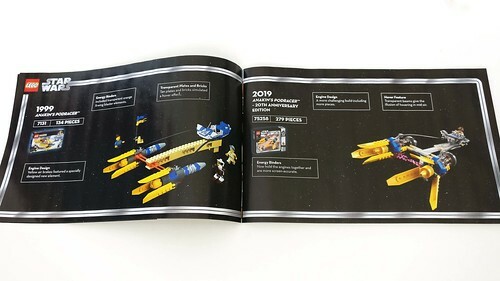 There’s a two-page spread comparing the original set to the new 2019 ones. 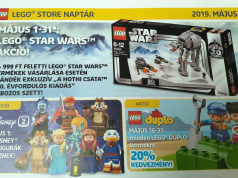 In addition, there’s a page dedicated to the exclusive Luke Skywalker minifigure with a short blurb of his story. 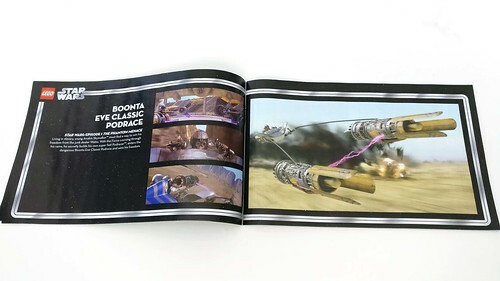 Lastly, there another two-page spread of a couple of scenes of the Boonta Eve Classic Podrace along with a short description of the scene. 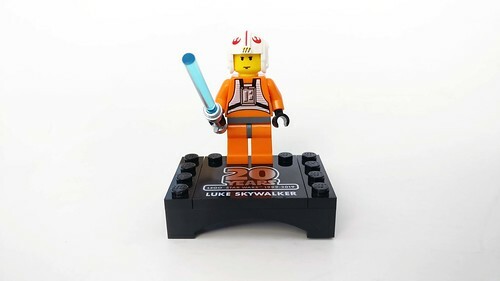 The set includes minifigures of Anakin Skywalker and Padmé Amidala as well as an exclusive 20th Anniversary Luke Skywalker. Anakin has on his tan outfit that is based on his appearance in Star Wars Episode I: The Phantom Menace. 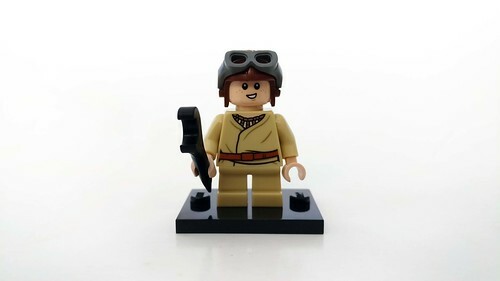 It is slightly updated from some of the previous young Anakin minifigures that have been released since 1999. If you compare them, the torso has some subtle differences whether it be the wrinkles on the tunie or the color of the belt. He does have a double-sided head with a smile on one side and a concerned look on the other. He wears a brown helmet with some gray goggles. His accessory is a wrench. Padmé has on the outfit that she is seen wearing on Tatooine. The outside tan tunic now has some pattern details on the front and back of the torso. Another thing that is new with Padmé is that she has the newer medium-sized legs tht were introduced with the Harry Potter Collectible Minifigures. She has a double-sided head with a content look on one side and an angry expression on the other. Her hairpiece is a new mold for her braids. 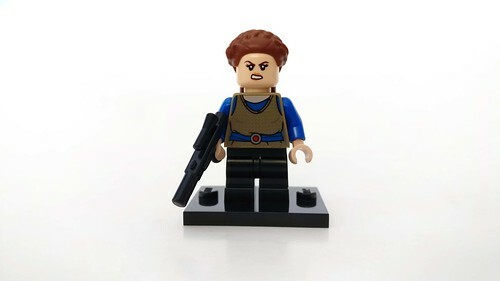 Her accessory is a blaster. 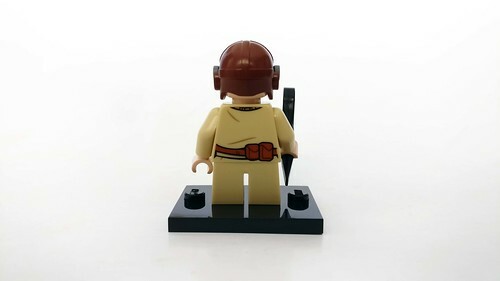 The last minifigure in this set is the exclusive 20th Anniversary Luke Skywalker. 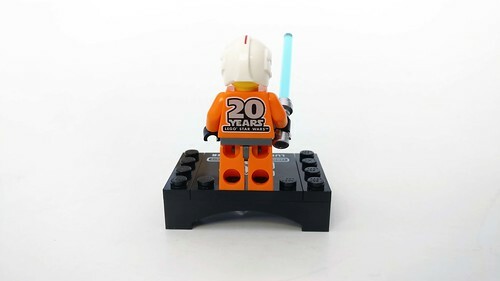 It is pretty much the exact same one from 1999 with his orange Rebel Alliance suit. 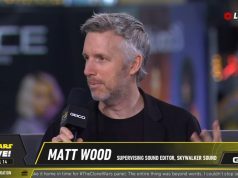 The thing that makes it exclusive is the printed 20 Years LEGO Star Wars on the back of the torso. 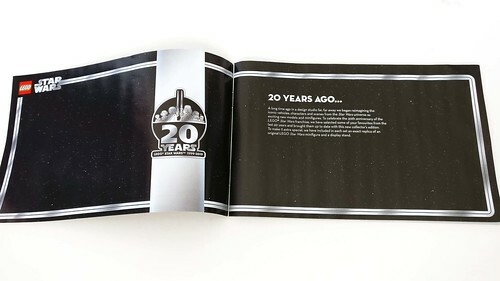 Also included with him is a display stand that also has the printed 20th Anniversary logo. 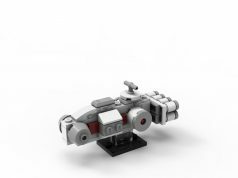 LEGO also included a black 2×4 plate with him but I’m not sure what that is for. 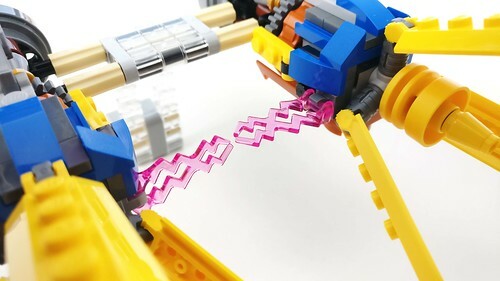 Update: As Purple Dave states in the comments, the plate is used to connect the display bases together. 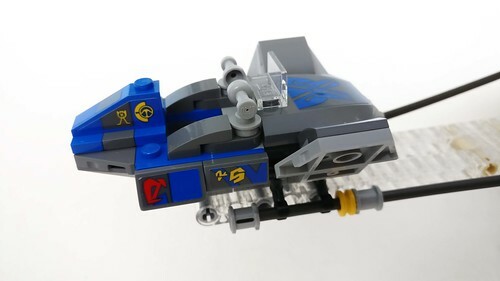 The only build in the set is the podracer itself. 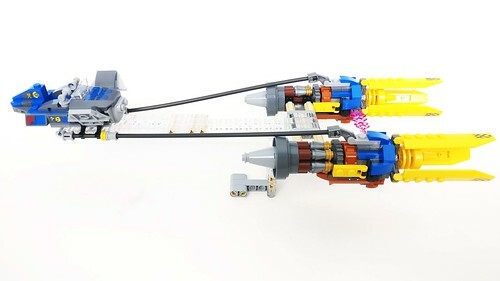 Instead of reissuing the 7131 version brick-by-brick, LEGO made some slight design changes to this new podracer and it made it more screen accurate. 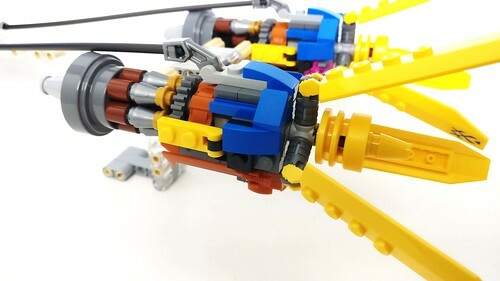 The twin engines in the front are more intricate with the parts used. The air brakes in the front use some flap pieces and they now have a small sticker in the front for the design. 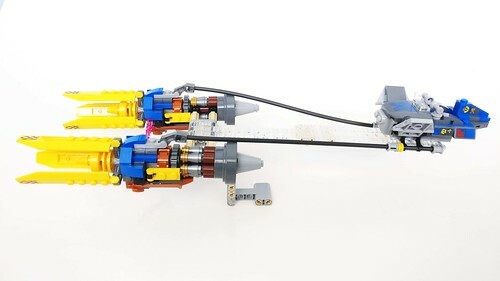 The energy binders that are between the engines now use the trans-purple electric bolt pieces. The pod cockpit area looks a lot like the previous version but is a bit more polished. There are a few more stickers for the details in the back. The controls for it now use the taps pieces instead of antennas. 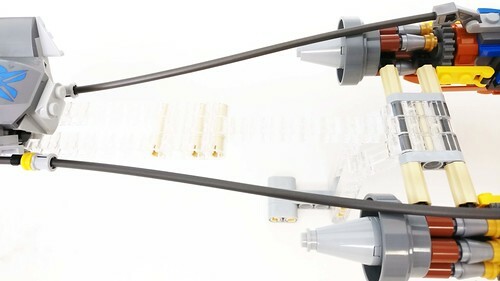 Like before, the pod is connected to engines using some flex tubes. The main change that is from the 7131 version to this newer 20th Anniversary one is the space between pod and the engines. 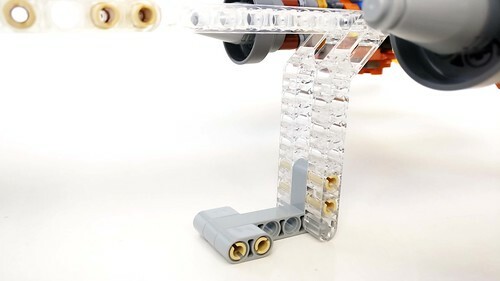 The former had some tan plates and bricks to hold the two parts together but now LEGO has changed all of that to trans-clear Technic beams to simulate the podracer flying. The bottom of it even has a handle for swooshability and it also serves as a display stand. 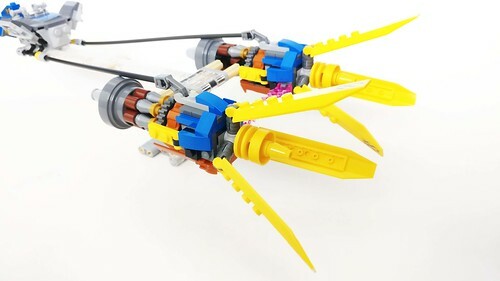 A big thumbs up on that design even though it’s a simple one. 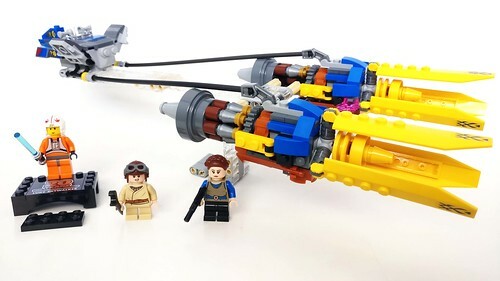 As I didn’t get back into LEGO until years after the first LEGO Star Wars sets were released, it’s nice for LEGO to release these 20th Anniversary sets for fans who want something new but based on something old as well as for newer fans who weren’t able to get the original sets that the anniversary sets were based on. 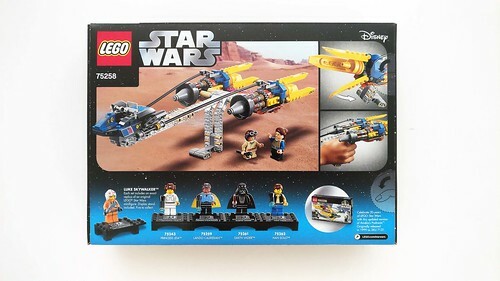 As far as Anakin’s Podracer (75258) is concerned, I like it but after looking at the sets that will be released in April, I would’ve preferred another set since there are so many other ones that have been released throughout the two decades. Also the price point is a bit too high for what you get. 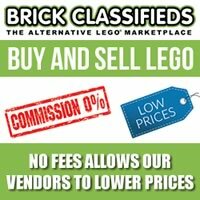 I think the extra cost is going towards the Luke minifigure and the cost of the newer parts used in the set. 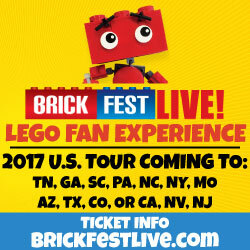 The updated design looks a lot better than the simple looking one from 1999. 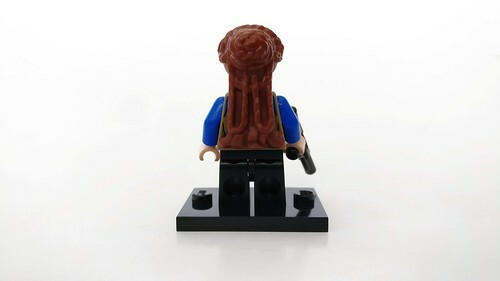 The minifigures are updated as well and use the flesh tone heads and hands. 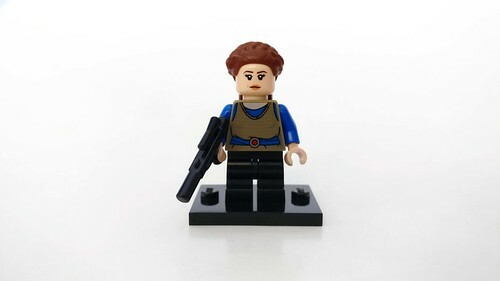 Probably the main thing that people will will looking forward to is the exclusive Luke minifigure with the anniversary printing on the torso. 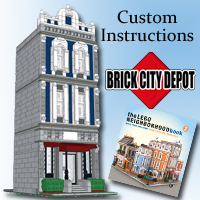 Thank you to LEGO for sending in this set for me to review. The content above represents my own opinion and not the company. 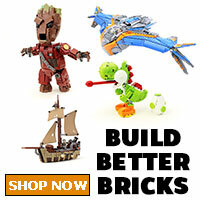 Review sets sent in does not guarantee a positive review.